I made these for my cousin's godson along with some Red Velvet Cupcakes. 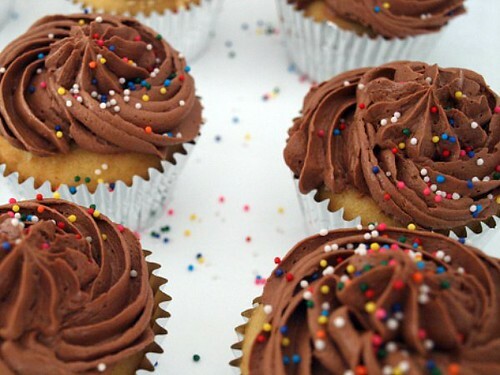 It's a simple Vanilla Cupcake recipe. I got the recipe from the Joy of Baking website. It wasn't as light as I'd hoped, but they did rise quite well, and they taste good. The recipe calls for lemon zest. I didn't have any, and used lemon extract. I think I used too much because the lemon taste was stronger than I'd hoped. Next time, I'll use Vanilla Extract instead. 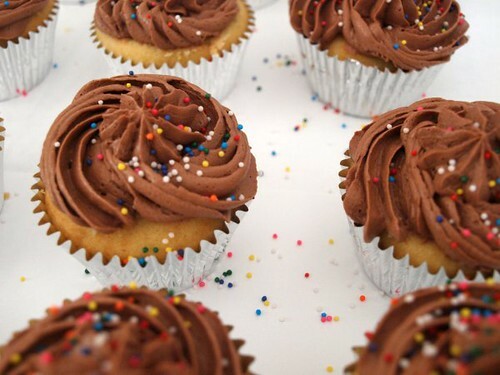 The recipe makes exactly 12 cupcakes, so double if you want more. I topped them with Chocolate Buttercream. Evenly fill the muffin cups with the batter and bake for about 18-20 minutes or until nicely browned and a toothpick inserted into a cupcake comes out clean. Remove from oven and place on a wire rack to cool. Once the cupcakes have completely cooled, frost with icing. If you want flat topped cupcakes then slice off the dome of each cupcake, with a sharp knife, before frosting. Cupcakes always take me back to my elementary school days. My mother would make them for me to take to school on my birthday. Thanks for the memory. Yours look delicious. By the way I agree with you about Red Velvet cake. I don't get the hoopla about it either. Also.... Thanks for stopping by my blog!